The expense of drug rehab is one reason many people don’t seek treatment, but there are many available options to help with payment. Paying for drug and alcohol rehab can be a stressful burden that may deter a person from receiving treatment, but the cost should never prevent a person from overcoming addiction. Entering rehab and learning how to manage addiction can save people money and heartache in the long run, so a person should consider all payment options before turning their back on drug rehab and recovery. The exact cost of drug rehab and substance abuse treatment is likely to vary and depends on the severity of addiction, level of care, and the specifics needs of the individual seeking treatment. Inpatient drug rehab, or residential treatment centers, may be more expensive than outpatient programs but may offer more services and care. For example, outpatient services for methadone treatment costs on average $126 per week, adding up to over $6,500 a year. This cost doesn’t include behavioral therapy, an essential component of addiction treatment. Residential drug rehab is wide-ranging and the cost depends on the person, their level of addiction, and how long they stay. For example, some 30 day programs could be as low as $1,000, cost as much as methadone treatment for a year ($6,500), or cost over $25,000. Regardless of the cost, paying for drug rehab should never stop a person from seeking treatment. Thousands of people are dying every year from misusing opioids, and there are several payment options a person can pursue to make treatment affordable. 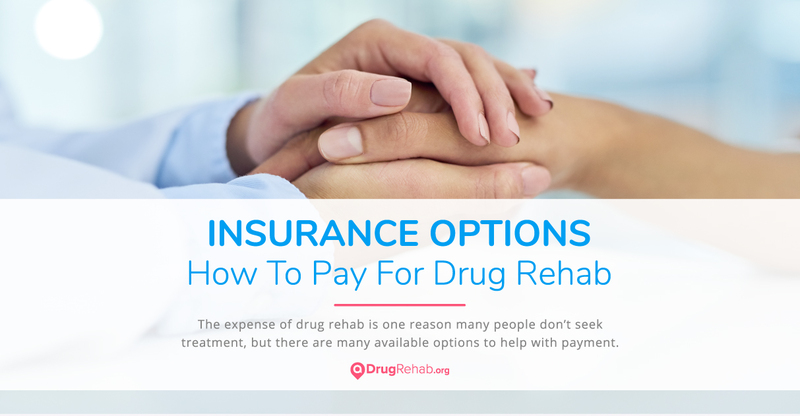 Many private insurance plans are likely to cover some of the cost of drug rehab. While the exact coverage will depend on the type of plan, most plans should cover a portion of the cost, if not all of it. To determine if a person’s healthcare plan covers the cost of drug rehab, contact the insurance company via phone or website for more information. Otherwise, many rehab facilities have addiction specialists standing by who can help people determine if their health insurance covers the services the addiction center provides. Reach out now too see if an addiction center is covered by your insurance. The Affordable Health Care Act (Obamacare) has opened the health insurance marketplace to many affordable options of care, some of which may cover the cost of drug rehab. Substance abuse treatment is a requirement of coverage for many healthcare providers found through Obamacare, so if you bought insurance via Obamacare, treatment is likely covered. If a person doesn’t have private insurance, public options like Medicare and Medicaid may help pay for some of the cost of drug rehab. Medicare and Medicaid are both federal programs implemented at the state level, so whether or not they pay for drug rehab depends on the state. Medicare and Medicaid can offer some assistance to most states. If a person doesn’t have private insurance, they should consider Medicaid or Medicare to help pay for rehab. Eligibility depends on the state, so contact your local Medicaid or Medicare office or website for more information. If a person doesn’t qualify for Medicaid or Medicare and doesn’t have private insurance, they may want to look into different state and local government programs. Throughout the country, there are several state and local government programs that offer drug or alcohol abuse services. Programs are likely to vary state by state and may be offered through state government, local government, or a different agency focused on behavioral health. Both inpatient and outpatient services may be offered, and some may even provide continuing care after treatment. These programs are likely to feature strict guidelines and requirements for entering treatment, like proof of residence in the state the program is offered, proof that other payment options are insufficient for addiction treatment, and severity and history of individual substance abuse. While these programs are good options for lower-income people in need of treatment, they can be hard to get into, have long waiting lists, and may require people to travel on a daily basis. If no government programs are available in your area, applying for scholarships or grants to help pay for rehab is another alternative payment option. Payment options are also available through grants offered by the Substance Abuse and Mental Health Services Administration (SAMHSA). A Substance Abuse Prevention and Treatment Block Grant (SABG) provides services and activities to prevent substance abuse. The SABG program hopes to offer additional substance abuse services to populations like pregnant women, women with dependent children, and people who use drugs intravenously (via injection). Some scholarships and grants may be difficult to apply for and receive. As another alternative payment option, a person can look to people close by who may be willing to support them in recovery. When considering payment options for drug rehab, a person should recognize loved ones likely want to help them get clean and sober. Addiction is a disease with the potential to damage families and relationships, and friends and family members may want to contribute to helping a person begin recovery and receive treatment. If a loved one is paying for a person’s rehab, they should make the payment directly to the rehab center. This will avoid any suspicion the person is asking for money to score more drugs or alcohol and will give peace of mind to the family member loaning their support and finances for treatment. Loved ones are also likely to support a crowdfunding endeavor, another good payment option for drug rehab. Crowdfunding is a good payment option for people without insurance or who don’t qualify for Medicaid or Medicare. Websites like GoFundMe or KickStarter offer platforms for fundraising that reach a wide range of people. Due to the worsening opioid epidemic, many people may be willing to contribute payment for a person’s rehab and recovery. A person may want a family member or friend to help out in order to ensure any raised funds go directly to rehab, not further drug use. Crowdfunding may be effective for people with a strong support system to help with fundraising to pay for treatment. If crowdfunding is too difficult, a person may consider taking out a personal loan. Personal loans may be an option for people without insurance who have to pay out of pocket. While a person should always consider taking out loans as a last resort, it may be an option for people struggling to pay for rehab. Some loan companies may specialize in helping pay for drug rehab and may offer loans with low-interest. Always be sure to check with the rehab facility regarding payment options. Many rehabs offer a sliding scale of payment, making payment more affordable for lower-income persons. Call now for more information on payment options for drug rehab. National Institute on Drug Abuse—How Much Does Opioid Treatment Cost?